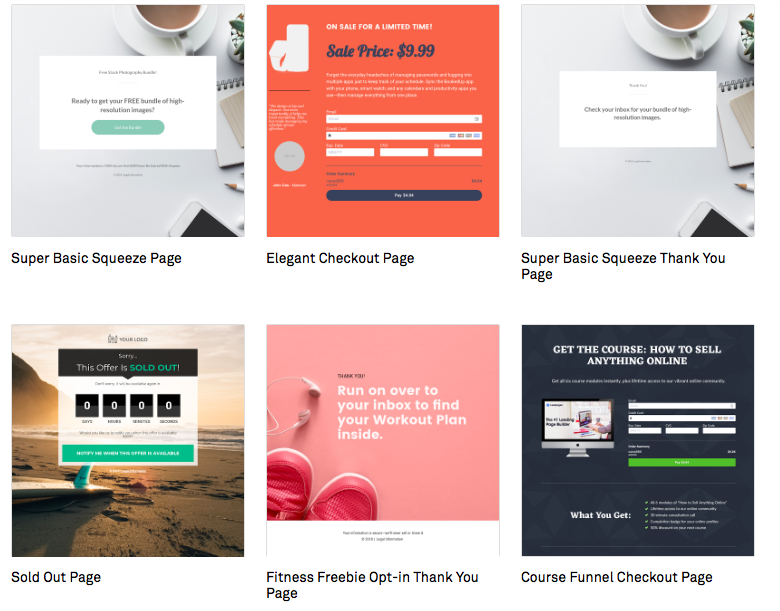 Every form that’s built with Thrive Leads looks great as they offer an extensive library of templates to customize, so no worries if your design skills are somewhat lacking. These templates are also optimized for conversion rates so you can just build and activate, without needing to do loads of research and testing on conversion techniques. Thrive Leads really offers all the tools you need to grow your list without any hassle. The split testing and reporting features are particularly useful as they show you exactly what’s working and allow you to experiment with different types of form and calls to action. Price: $67 for a single site license, or $19 a month as a member of Thrive Themes for access to all themes and plugins. OptinMonster is designed to increase the conversion rate of your website – converting visitors into subscribers, growing your email list, increasing page views, and getting more sales. This plugin comes with over 65 pre-designed mobile-friendly form templates that are ready for you to customize as you wish. An advanced targeting engine also allows you to show personalized messages based on user behavior. OptinMonster is particularly powerful in its targeting based on location, device, referrer, page, cookie, and more. It’s a good choice for eCommerce sites running segmented marketing campaigns. Price: $9 – $29 a month depending on the features required and the number of sites you want to use it on. 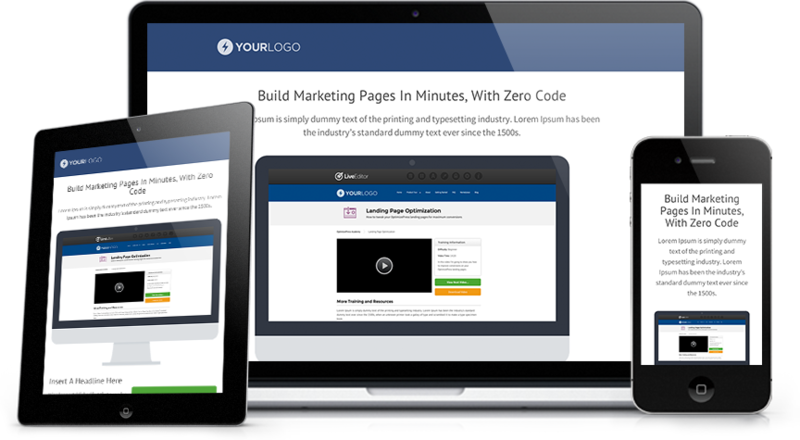 OptimizePress is a landing page builder rather than an opt-in form builder. It provides mobile-ready templates for creating landing pages, sales pages, and product launch funnels. Sometimes the optimal way of building your list is by using targeted landing pages rather than a form integrated with the rest of your content. Of course you don’t have to choose between the two – often a combined approach is the best option. Most list building plugins don’t have the option to build whole landing pages so OptimizePress is definitely worth a look if that’s what you’re trying to do. It’s really easy to use with a drag and drop builder and you can choose to either customize one of the pre-built templates or start from scratch with your own design. As well as the all-important opt-in form, there are over 40 custom elements to choose from when you’re building your page such as testimonial blocks, progress bars, and video players. Another feature that will come in handy for some users is the plugin’s capability to create secure membership portals – you can create a member’s only area of your site as an incentive to sign up for your mailing list without the need for any extra software. Price: $97 for use on up to 3 sites. Bloom is one of the plugins offered with Elegant Themes membership, which means if you’re already an Elegant Themes member, you can use it on any of your sites for no additional charge. The pop-ups and fly-ins can be triggered by various user actions including time spent on page, reaching the bottom of the post, after scrolling, or after purchasing. However it’s notably missing the “exit intent” trigger that’s a feature of some other plugins. Just like the themes that Elegant Themes is most famous for, Bloom is beautifully designed and comes with over 100 professional templates that you’re free to customize for your own purposes. Bloom strikes a nice balance between offering a flexibility and customization without being bloated and providing you with lots of extra features you probably won’t use. Like OptimizePress, Leadpages is a landing page builder that you can use to create launch pages, opt-in campaigns, and more. It comes with over 160 beautifully designed templates ready for editing, that are optimized for conversion. In fact you can even choose templates based on their conversion rate to give yourself the best chance at getting new sign-ups to your mailing list. Leadpages also comes with a Facebook ad builder, which will come in handy for those looking to build an audience through social channels. Leadpages comes with its own plugin for WordPress so you can easily integrate it into your site without any additional software. Price: Leadpages starts at $25 a month. If you’re not sure if it’s a right fit for you, there’s a 14-day free trial so you can try out the software before committing to it. Welcome Mat adds a full-screen call to action on landing. Image Sharer – makes it easy to share your images on Pinterest, Facebook, and Twitter. Price: Sumo is available for free for those just starting out who have up to 200 email subscribers. For everyone else, memberships start from $24 a month. 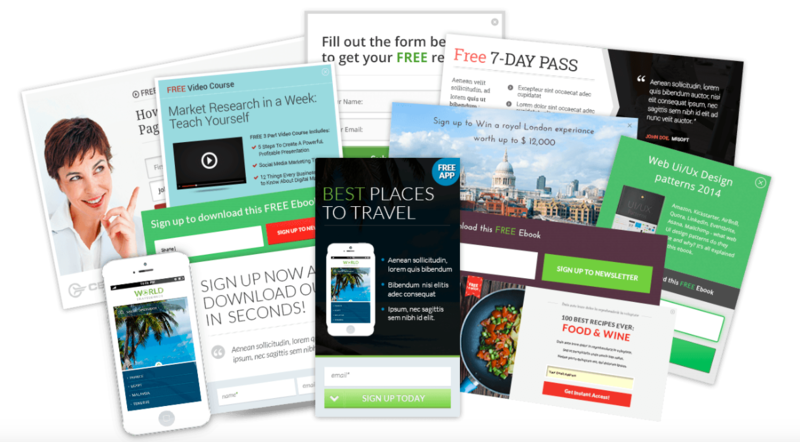 Ninja Popups integrates with all the popular mailing list software and makes it easy for you to create pop-ups that are specifically designed to convert. A drag and drop editor simplifies pop-up creation and there is a library of over 70 pre-designed themes to choose from. The pop-up can be triggered by exit intent, scrolling, or after a set time of inactivity. You can also target different pop-ups for different pages. Ninja pop-ups is very reasonably priced and a lot cheaper than many of the other list-building plugins. It doesn’t offer as much customization and as many features as some other solutions, but if you just want to create pop-ups, it’s a great value option. For a small additional fee you can buy add-on packs including the Opt-in Bars pack to turn your pop-up into a bar ($12), the Widget Extra add-on to integrate your designed pop-ups into content as a widget ($8), and an extra theme pack, which includes ten new theme designs ($9). Optin Forms is a free plugin developed by the team at FancyThemes and is a simple solution for creating opt-in forms on your website without any coding knowledge or fuss. It comes with five customizable form designs and works with 7 of the most common email marketing solutions including AWeber and Mailchimp. This plugin doesn’t have the fancy templates and advanced features of many of the other list-building software solutions. However if you’re after something simple and free, and you’re using one of the supported marketing platforms, it does the job. 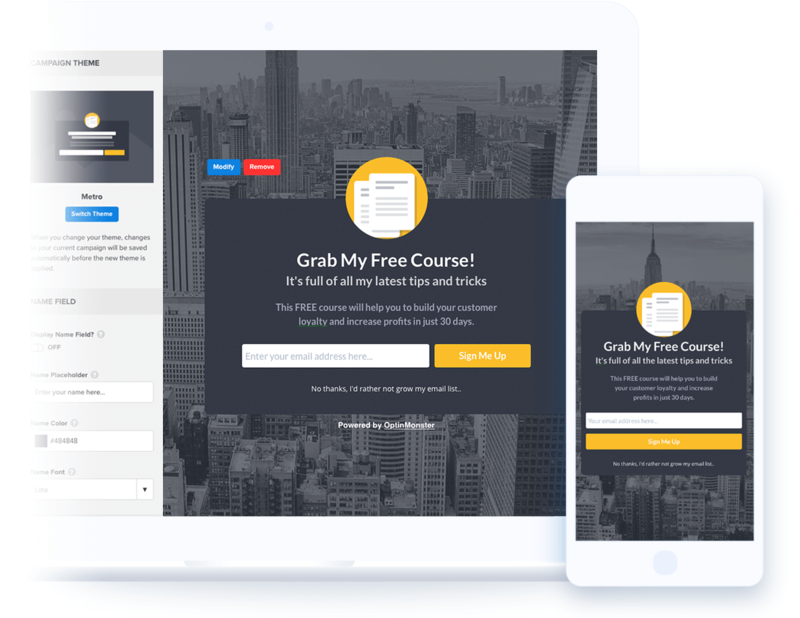 Hustle is an all-in-one marketing plugin from the team at WPMU DEV that allows you to create email opt-in forms as pop-ups, slide-ins, embedded forms or floating bars with a variety of animation effects. Smart exit intent technology means you can catch visitors’ attention before they leave your site, and the software also overrides Adblockers. Hustle is available for free with the ability to create one opt-in and one pop-up or slide-in, or you can upgrade to the pro version, which allows you to create unlimited opt-ins. The pro plugin is included with WPMU Dev membership, which is $49 a month and is a complete WordPress management console including over 100 plugins, themes, security, backups, and support. All of these plugins work well and will make the task of building your list much easier and faster. If you’re still not sure which one to pick, take a moment to think exactly what you want from a plugin. If you just want to add a simple subscriber form in a pop-up and you’d rather not spend any money, one of the free options such as Hustle or Optin Forms will do the job. Thrive Leads and OptinMonster are both premium solutions with lots of features. If you’re managing lots of sites, OptinMonster’s cloud-based dashboard will make your job easier, but otherwise Thrive Leads works out better value for money with a one-off payment. If you want to build landing pages rather than just a couple of pop-ups, you’ll love the advanced functionality of OptimizePress or Leadpages. For Elegant Themes members, no need to buy an extra plugin as Bloom does the job beautifully. If you’re not already a member you might want to consider it to get access to the themes and other plugins. Have we missed out your favorite plugin? Tell us about it in the comments. Why aren’t their solutions for the stock WordPress Jetpack Email subscription forms? I have been using them and it’s completely free. The only lack is the support for Jetpack Email subscription forms or its shortcode. It sends an email to every email subscriber automatically whenever a new post is published. This list is obviously missing the new kid on the block called MailOptin (https://mailoptin.io). It has a generous free version at WP.org repo which is more than enough for most of my needs. Great list of plugins for building email list by the way.